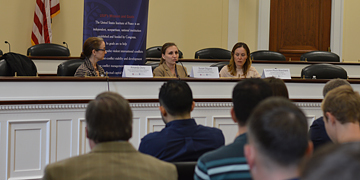 The Conflict Briefing Series is a joint effort by Partnership for a Secure America (PSA) and the United States Institute of Peace (USIP). 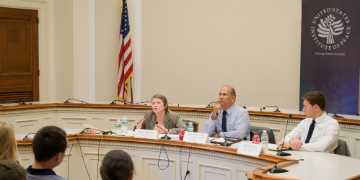 The series, started in 2012, is an educational program designed to provide congressional staff with opportunities to engage leading experts and fellow Capitol Hill staffers in bipartisan forums. 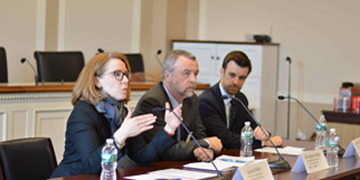 The program aims to build cross-party relationships, encourage bipartisan dialogue, and equip staff with new perspectives on critical issues in the international conflict resolution and prevention field. 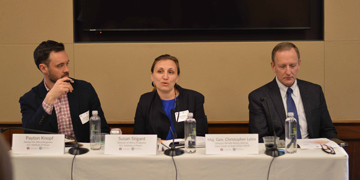 The series has engaged hundreds of congressional policy advisers and has featured events on conflict resolution in countries including North Korea, Colombia, Iraq, Ukraine, Syria, Tunisia, and South Sudan. 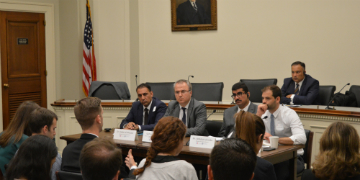 Experts affiliated with AEI, the Heritage Foundation, the Wilson Center, the Department of Defense, the Department of State, Brookings, the Atlantic Council, the German Marshal Fund, and many others have spoken at events for this series. Notable speakers include General John Allen, Ambassador Bill Taylor, Ambassador James Jeffrey, General Jan-Marc Jouas, and Ambassador Thomas Pickering. https://www.psaonline.org/wp-content/uploads/2016/02/WisnerBishaiTunis.jpg 180 360 actualize studio https://www.psaonline.org/wp-content/uploads/2015/12/logo-psa-web.png actualize studio2015-09-29 15:21:322016-05-31 11:08:46Can Tunisia Survive Threats to Democratic Change?